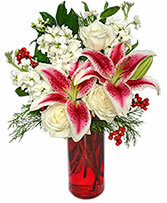 Red Cylinder Vase, Foliage: Holly With Berries, Seasonal Evergreens, White Roses, White Stock, Stargazer Lilies. This HOLIDAY BEAUTY bouquet is chockful of reds, whites, and plenty of holiday style and elegance! Let ROCKVILLE FLOWER & GARDEN deliver this beautiful gift of flowers, along with your wishes for a happy holiday season. 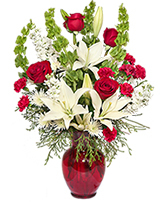 Red Classic Urn Vase, Foliage: Seasonal Evergreens, Red Roses, White Asiatic Lilies, White Stock, Red Mini Carnations, Bells Of Ireland, White Novelty Poms. The CLASSICAL CHRISTMAS arrangement from ROCKVILLE FLORIST & GIFT BASKETS is one of the best last-minute gifts around and adds a fresh touch at holiday parties and get-togethers. 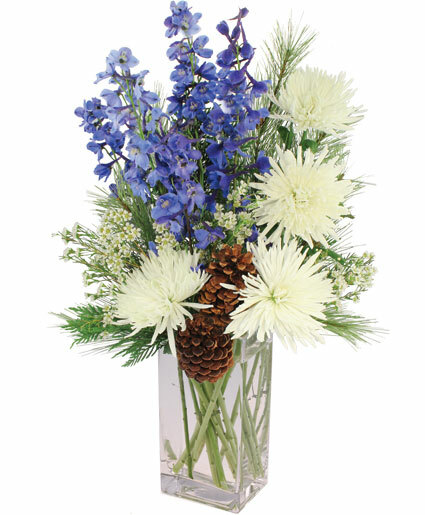 To order, call our shop in Garrett Park, MD or send holiday flowers online 24/7.